Well, this is a 2 tiered fairy themed cake requested by a mom to her 4 years olddaughter. 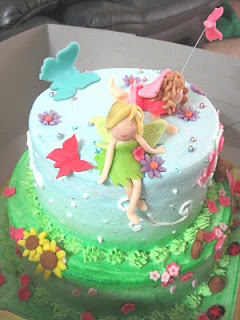 The cakes are coffee and chocolate flavoured for bottom and top tiers respectively, covered with buttercream and decorated with fairies, snails, mushrooms, ladybugs, flowers, ya, lots of flowers and flying butterflies. Mom helped me to cut the flowers besides baking the cakes. Good job, mom! 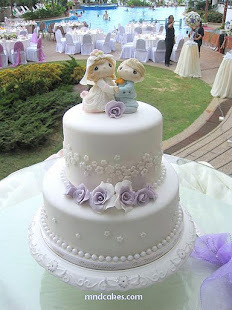 We delivered the cake to Island Park, Penang on a beautiful Sunday then. Not only mom followed me but my nephews too. They sang all the way inside the car, haha, if cake delivery to Penang could be that fun, I don't mind to deliver more cakes to the island, hehe!